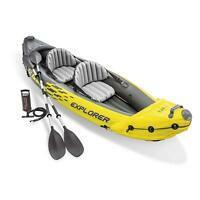 Details about SEA EAGLE 370 PRO PACKAGE INFLATABLE 12.5 FT KAYAK NEW FACTORY SEALED 3-YR WTY! SEA EAGLE 370 PRO PACKAGE INFLATABLE 12.5 FT KAYAK NEW FACTORY SEALED 3-YR WTY! You can go on fun adventures with this Sea Eagle two-person kayak. The kayak is inflatable and attains 1.1 pounds per square inch of pressure. It takes eight minutes for the kayak to fully inflate, so you’ll be on the water quickly. Made of 38mm Polykrylar, it resists punctures from rocks. 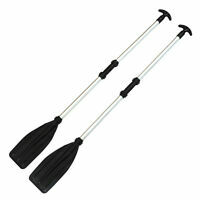 It is suitable for up to Class III whitewater rafting. The kayak has a load capacity of up to about 650 pounds. All Great , fast and easy ! Thanks ! Honest seller, no problems, nice socks!!! Quick shipping and product was in great condition! Excellent communication. Five stars for follow-up on missing part. We went out on the kayak today and had such a great time! It is super easy to transport, set up, clean-up and repack. Best money we've spent on something in a long time, hoping to get many years of memories out of this purchase! It's lightweight yet sturdy. I was worried about tipping, but it was easy to get in and out of and gliding through the river was a breeze. Good price for fun but not the best for fishing. Great for casual fun and light fishing. Without a rudder it's difficult to direct in any wind. Claim lake early morning or late works good for fishing. Very stable! Would not have problem with young teens solo. Easy to transport. Takes about 15 mins to inflate with bellows. Great quality and a whole lot of fun! I ordered this Boat because my wife loves to kayak and normally that is a one person activity. I wanted to share in her love of the sport, But I am a short (5'7")and quite stout guy (300+ lbs). I got the 3 person boat because I read in other reviews that people felt cramped in the 2 person boat and I wanted to be able to carry more things on the boat if I wanted to without worrying about the weight. My wife and I went to a local lake to try it out and spent 4 hours just having a great time! We are planning more trips and plan to take this with us during our vacations in case we find a place to kayak. It folds up small enough to bring with us as we travel in an SUV. If traveling in a car you may have to give up some space for it, but for us, it won't be a problem. It took me 10-15 minutes to set up by myself and we carried it to the water, climbed in and set off. I had to adjust the seats for my bigger frame but it was quite comfortable. I had room to stretch out my legs, but I could see where the smaller craft would seem too small. I'm not sure I would put three people in this boat and it only comes with two seats anyway. It would be possible to have three but you would have to sit with your feet crossed, which on a lake requires a lot of paddling. Perhaps on a river three could sit like that since it wouldn't require as much paddling. The boat tracks well because of the fins on the back. We tried a different and bigger boat and the back end kept wanting to slide so it was hard to steer. Either one of us could paddle alone and still keep us moving along, and when we both paddled we got up some good speed. This boat is 1 1/2 feet longer than it's 2 person version and weighs only a few pounds more so I chose this one. The Price was great too. My wife has a 1 person plastic kayak and we paid almost as much for that one, and it was on sale. After the lake we let out the air and brought it home to wash it down and dry it out, before putting it back in the bag, but you could certainly let it dry with a couple of hours in the sun after the ride, but we wanted to be careful. The boat feels sturdy and is made with a thick material. Some people said in their review that they felt like tipping was an issue. I could understand that because I felt that especially at first but as we continued to paddle around I felt more confident in not tipping. This was a larger lake and people were using jet skis and ski boats so there was some waves and we never came close to tipping over. Also the seats are comfortable when you adjust them to the way you want to sit inside the boat. You can sit perfectly upright or leaned back, which was a more comfortable position for me. As per someone's suggestion I inflated this boat in my living room first to check for any leaks, and there were none but it was good to do anyway. I hope this review is helpful for those thinking about buying this or deciding between this and it's smaller version. Received kayak in good time. Kayak is great but one of the seats is deformed and will not inflate properly. Ebay makes you pay shipping back whole product,i only want a new seat,and cannot contact anyone, the contact link is not working.